What is a meteorite? Use our introductory reference to learn more. NWA 11119 is a 453-gram (nearly 1-pound), baseball-sized meteorite found in Mauritania in December 2016. NWA 11119 is the oldest igneous meteorite yet dated. What does NWA stand for? Although the meteorite was discovered in 2016, no one knows when it actually fell to Earth—the rock could have been in the sand for weeks or for centuries. NWA 11119 is the oldest igneous meteorite yet dated. What is an igneous meteorite? Igneous rocks are formed by the cooling of magma or lava. Meteorites are space rocks that fall to Earth’s surface. So, igneous meteorites formed from some type of volcanism on an extraterrestrial body, such as a planet, moon, or asteroid. NWA 11119 is a type of igneous meteorite known as an achondrite. Achondrites are a type of stony meteorite containing no hardened droplets (chondrules). 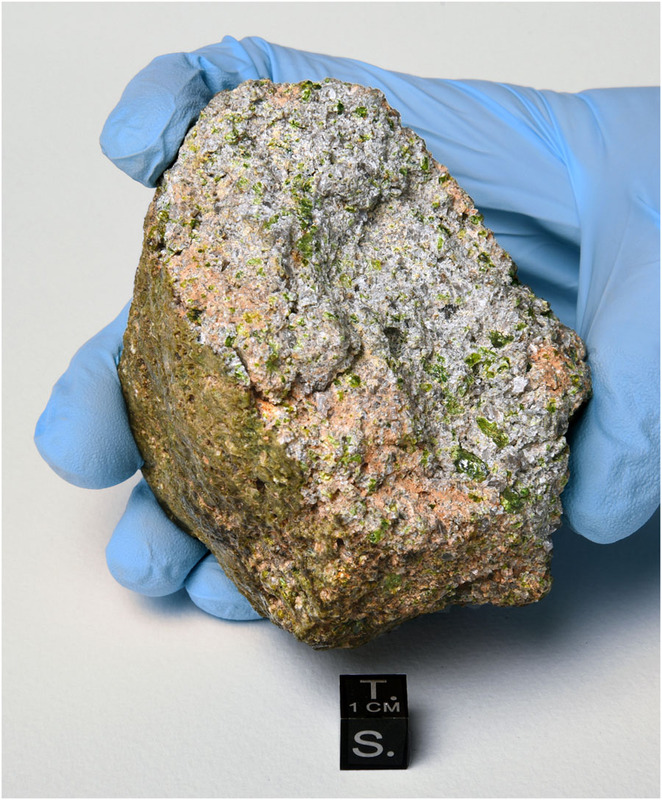 Achondrites are the rarest type of meteorites, making up just 3%-8% of all known space rocks. NWA 11119 is further described as a ureilite, an even rarer type of achondrite. Ureilites are achondrites with unknown origins—not our Moon, or Mars, or an identified asteroid. The diamond-studded Almahata Sitta meteorite is another well-known ureilite—and a possible sister rock of NWA 11119. Learn more about the Almahata Sitta here. NWA 11119 is older than our solar system’s rocky inner planets and moons. So where did it form? NWA 11119 may be a remnant of volcanic activity on a long-gone planetesimal or protoplanet. Protoplanets are similar to dwarf planets such as Ceres or Pluto, with more radioactive elements present. NWA 11119 may also be a remnant of an asteroid. Asteroids are the debris of protoplanets, “the remains from the formation of the solar system formation some 4.6 billion years ago.” Today, asteroids orbit the sun in a thick “Asteroid Belt” between Mars and Jupiter. Scientists have tentatively linked the formation of NWA 11119 to a specific process associated with planetary formation. What is this process? planetary differentiation. Planetary differentiation describes the process by which heavy elements sink to the center of protoplanets through 1) continual impacts and collisions with other protoplanets and asteroids, 2) radioactive decay, and 3) gravitational pressure. These heavier elements evolve into a planetary core and mantle, while lighter elements evolve into a planetary crust. How is NWA 11119 different from most meteorites? Take a look at the beautiful Almahata Sitta to spot some contrasts. The most obvious difference is its color. 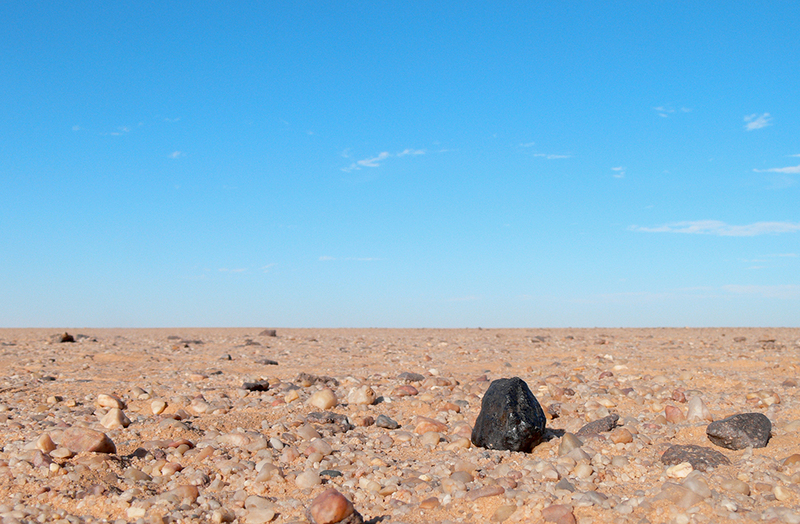 The Almahata Sitta meteorite is what a “typical” meteorite looks like—black, shiny, dense. NWA 11119 is lighter-colored, porous, and flecked with clear and green crystals. As its appearance indicates, the mineralogy of NWA 11119 is “is very, very different from anything that we’ve worked on before,” says one scientist. NWA 11119 includes a huge proportion of silica, while most meteorites are composed mostly of basalt. Take another look at the Almahata Sitta. Why do some scientists think that NWA 11119 may be a sister-rock to the Almahata Sitta? The Almahata Sitta may have formed in the mantle of such a protoplanet, while NWA 11119 may have formed in the crust. How does the mineralogy of NWA 11119 help us understand the early solar system? Nat Geo: What is a meteorite?